Planning Knife Grinder Sharpening Machine Model suitable for grinding, planning Knives and various types of blades, equipped with rack and pinion drive longitudinal slide for quick and faster grinder AC 440/3/50 electric motor - HP mounted on swivel graduated base, rotary "On" "Off" switch, cup type grinding wheel and wheel guard. Knife grinder machine 4" & 8 fitted with 5 hp motor, one 3 hp motor 3 center reduction gear box. Body fabricated from 8 mm plate 0. 25 hp coolant pump. Extra heavy duty CIi knife holder and fiited with electric panel. Indo Foreign Machinery & Manufacturing Co.
We manufacture and supply a wide array of Knife Grinding Machines, which is engineered using world-class quality. Our such equipment are developed on the basis of advanced technology that is cost effective and easy to operate. These are very efficient and find their application in various industries for diverse purposes. 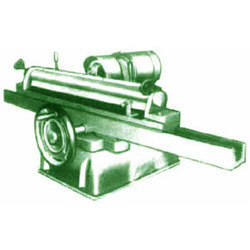 We are affianced in offering the finest quality Automatic Knife Grinder Machine. Our knife grinder is designed to grind straight knife and the grinding length can be 1500-700mm according to customer’s requirement.Adopting the technology at home and abroad, this newly developed machine has reached the international level and has become a necessity for many knife users. We are the reputed trader and supplier of a premium quality range of Band Knife Grinder Stone. To meet the variegated specifications of our reputed clients, we are engaged in manufacturing and supplying a wide array of Planer Knife Grinder Machine. The circular knife grinding machine is capable of both peripheral, face & bevel grinding with capacity to grind circular upto 300mm dia.It is Used for grinding ring shears, circular knives, top & bottom slitter knives etc. We offer high quality Automatic Knife Grinder to our customers.